The beachfront street known as The Strand in Hermosa Beach usually has a multi-million dollar price tag and is certainly out of the range for most buyers. A potential option for those looking to live the good life without the rich and famous price tag is the condo/hotel known as the Beach House at 1300 The Strand. Units are individually owned but can only be used by owner a total of 90 days a year. The rest of the year the on site management rents out the units and revenues are split 50/50 between owners and management. Not all of the units are beach front, but the newest listing from South Bay Brokers is not only beach front but sits high on the top floor offering panoramic ocean, beach and pier views. In this market any homes for sale can seem like a rarity, but beachfront homes are even more rare. According to local real estate specialist Keith Kyle with South Bay Brokers, “There are a very limited number of beachfront lots in Hermosa, and that will never change. These homes are very rare, but with the recent price increases in which we’ve seen new construction near the $15,000,000 there are definitely sellers testing the waters which makes for multiple opportunities for luxury buyers looking for that rare property”. 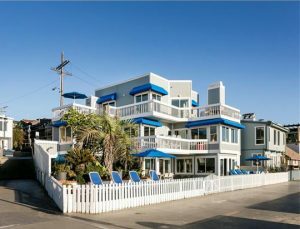 Recently listed is the beachfront home at 2624 The Strand. The 2600 block is a fairly ideal location as the elevation from beach to street offers the potential for a slightly higher home. The home is fairly dated with 3758 square feet on three levels and being built in 1962. As an older home, however, it does enjoy some of the benefits that new homes don’t enjoy as setback restrictions were more forgiving at the time.